Why? "The turnover, lost productivity and recruitment costs that this should help address are significant. I'm willing to make this investment," he said. "I hope it benefits our employees, and we will learn how it helps our overall business. That is the nature of innovation versus just managing a business." This cost-benefit approach doubtless plays well with business analysts. But it turns out there was more on Bartolini's mind. "Companies are not just money-making machines," he told James Surowiecki a month later. "For the good of the social order, these are the kinds of investments we should be willing to make." Since 2011, the issue of income inequality in the United States has moved from the surprise of Occupy Wall Street to the forefront of a national conversation. Oxfam recently reported that between 2009 and 2014 the share of wealth owned by the top 1 percent has increased from 44 percent to 48 percent, and the World Economic Forum put the issue first on this year's list of global trends. Nixon-era Economic Advisor Herbert Stein had a wonderful saying: "If something cannot go on forever, it will stop." The issue is economic as well as political: Recent research has suggested that societies with more equal income distributions have better outcomes in terms of physical and mental health, crime and imprisonment, and other social problems, and that, contrary to economists' prior beliefs, the savings from these outcomes add to the efficiency of these countries' economies. •	Reputation. The ubiquity of information now leaves companies with little room to hide when their activities are perceived to be harmful. Public pressure is in play with respect to all kinds of corporate behavior: General Motors hurt its standing by suppressing recent safety problems; Apple, on the other hand, responded in a matter of months to concerns about working conditions in the factories of their Chinese suppliers. Income inequality will join the list of issues customers care about, and corporations risk being seen as a contributor to the problem if they do not take control of the narrative. •	Demand. Companies serving mass markets may see no growth in demand as their customers' consumption expenditures stagnate. •	Talent. Data about the values of the next generation of talent in the U.S. suggests that a company's social posture affects its desirability as an employer. •	License to Operate. For decades, host countries have imposed requirements on foreign investors with respect to local content or ownership; might India, say, begin to insist that companies meet certain standards of compensation equity in order to do business locally? How should companies respond to these risks? Over the past fifteen years or so, corporations have increasingly embraced their "externalities," that is, the costs they impose on others who have no power to prevent them. Most visibly, mainstream companies have taken ownership of their environmental externalities, establishing efforts to be "green" under the banner of CSR. On balance, corporate behavior has evolved from denying responsibility, to challenging evidence of impact, to embracing sustainability. But even for these companies, Social sustainability is not a recognized concern--yet. As noted, recent research finds that income inequality creates externalities: higher rates of murder, teenage pregnancy, mental illness, imprisonment, obesity, etc., causing both suffering and expense. Richard Wilkinson's book The Spirit Level is analogous to Rachel' Carson's Silent Spring, the 1962 book that documented environmental concerns for the general public. I've interviewed a handful of corporate executives about social sustainability. Thus far, all concur with the diagnosis that income inequality: (1) presents an increasing risk, particularly with respect to reputation and demand and (2) could be treated as a sustainability issue. However, although companies reported internal conversations about these issues, I found none that have made a commitment (internal or public) to any systematic program to address them. Some expressed fear that raising awareness further will just exacerbate their exposure. Nonetheless, some are engaged in activities that could ameliorate the problem--Whole Foods, Walmart, the Container Store, and others who embrace "Conscious Capitalism" take increasing responsibility for their externalities. 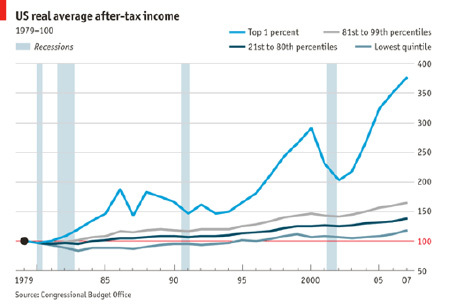 But they have not named income inequality among them. •	Taking Ownership: When an externality is clearly traceable to a company's operations, someone will measure and publish the impact, and expect the company to remediate it. P&G has taken responsibility for keeping its packaging out of landfills, for example. •	Taking Action: Coca Cola's operations in India were lowering the local water table, but they were far from the only water user. The company acted to convene the stakeholders and develop a plan for sustainable use. •	Taking an Interest: Royal Dutch Shell doesn't sell cooking oil, but is committed to a goal of universal access to clean energy. So the Shell Foundation supports NGOs that distribute cleaner stoves to families in Bangladesh. What does this framework say about corporate responsibility for income inequality? My interviews suggest the answers are far from complete, but they offer some hints. Companies control how they compensate their people. "The average multiple of CEO compensation to that of rank-and-file workers is 204, is up 20 percent since 2009," according to Bloomberg. The Dodd-Frank law mandated that companies report this ratio, but "some of America's biggest companies are lobbying against the requirement," Bloomberg reports. Meanwhile, some companies are taking positive steps, such as explicitly investing in the development of human capital. The Brazilian company, Cosmeticos Natura, employs about one million women in Latin America. For many, it is their first job outside the home. About 30 percent move on to other employers each year. But Natura doesn't see departure as a profit leakage; they see the improved earning power of their former employees as part of their output, a contribution to the economies that give them their license to operate. Is investment in people a cost, or an output? Taking responsibility for growing the human capital they employ helps companies attract talent and increase productivity, while benefiting the society. Hyatt Hotels is training every employee to deal positively with customers, helping to promote porters to customer service representatives. Aetna, of course, represents a direct action to increase compensation at the bottom end. According to Surowiecki, Bartolini simply "said that it was not "fair" for employees of a Fortune 50 company to be struggling to make ends meet." Supplier pay is a prime opportunity for action. Paying farmers a fair share for their products (Fair Trade for coffee, for example) and insisting that workers are paid what they are promised (the Electronic Industry Association standards) are examples. Whole Foods invests in its suppliers, in some cases overcoming their limited access to capital. In the environmental sphere, Walmart used its leadership position to insist its suppliers' packaging become less wasteful. Might another company similarly use its clout to establish a wage floor higher than the legal minimum wage? Or perhaps lead a major franchise group to make such a commitment? Some businesses will argue that raising the wages of its lowest paid employees, or restraining the compensation offered to its leaders, or investing more than its peers in employee development will put it at a competitive disadvantage. These propositions are seldom tested, but clearly it takes courage to flout this view and invite shareholder scrutiny. But there is safety in numbers. Industry groups have an opportunity to get in front of the issue of sustainable income distribution, rather than be dragged into it. As with antitrust and labor issues during the early industrial age, society will likely reign in this trend through some combination of regulation, legislation, court action, and social pressure. To be perceived on the right side of this issue, at a minimum, businesses can begin to mitigate the risks posed by continuing concentration of income by coming together to take a position that the sooner the curve is bent, the lower the risk to all businesses. And rather than opposing regulation like an increase in the minimum wage that might raise short term costs, they might look at the whole system and see, as they have come to in the case of "green," that getting in front of, or at least joining, the parade will be good business in the long run. Kraft, Nestlé et al had replaced trans fats long before the first state regulation banning them was passed. If this sounds unlikely, consider the Risky Business Project, an effort led by financial heavyweights including Mike Bloomberg, Bob Rubin and Henry Paulson urging corporations to begin today to do what's necessary to manage the risks of climate change--an externality issue once too contentious to to deal with has evolved into the motivation for long-term business strategy. The same will happen with social sustainability and income inequality in particular. Facing the issue head-on can create a new consumer segment, grow markets and build a trajectory of profit sustainability. And according to The Good Jobs Strategy, better paid workers contribute to profits, rather than diminish them. The corporate sector has more to gain than to lose by embracing social sustainability alongside of environmental sustainability.